During the formative years of the state aid bridge program, the Nebraska State Engineer designed several long-span through trusses. Among these were the Parshall Bridge, the Redbird Bridge, the Fremont Bridge, the Schuyler Bridge and the Gross Bridge. All but the Gross Bridge have since been removed. (Four spans of the Schuyler Bridge have been salvaged and moved to other locations.) And all used pin-connected Parker trusses. Developed in the mid-19th century by C.H. Parker, the Parker truss was, in essence, a Pratt truss with polygonal upper chords. The inclined upper chords afforded a degree of efficiency in long-span trusses, where bending moment stresses at mid-span greatly exceeded sheer stresses at the ends. The Parker's drawback was that, unlike the straight-chorded Pratt truss, the polygonal chords necessitated different-length verticals and diagonals at each panel, increasing its fabrication and erection costs somewhat. Because trusses were generally priced on the basis of their superstructural steel weight, the lighter overall weight of a polygonal-chord truss more than offset the slight increase in fabricating costs in spans greater than 160 feet. In the highly competitive bridge industry, this economy equated directly with profit, and pinned Parkers superseded Pratts for long-span applications after the turn of the century. They have suffered tremendous attrition in recent years, however, until relatively few examples remain in use today. Comprised of a 180-foot, Parker through truss with pinned connections, the Gross State Aid Bridge was erected in 1918 by the Western Bridge and Construction Company of Omaha. 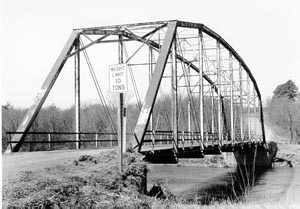 It is noteworthy as one of the few intact state aid structures remaining and as one of the best-preserved examples in Nebraska of this relatively uncommon vehicular truss type.